We will be updating this page in due course. The first Hate Crime Awareness Week took place last year and was launched with a historic event at a St Paul’s Cathedral. Following its success we are doing it all again and hope you’ll join us to help paint the country purple! 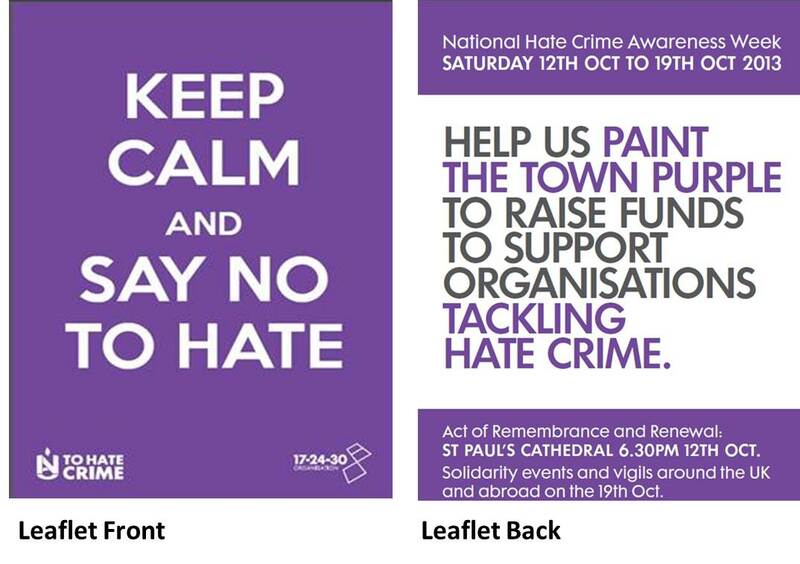 We are asking venues to decorate themselves purple and to work in partnership with local organisations, the voluntary sector, police and councils to promote the work that is being done to tackle local hate crime issues. 19th Oct Solidarity Vigils; Brighton, Kettering, Norwich, Plymouth and Reading. This year we have produced a range of “Keep Calm and Say No To Hate” t-shirts, badges and balloons. Details of how to get them will be available here shortly. Fundraising Events – organise a fund-raiser for 17-24-30 or one of the many other charities and organisations tackling hate crime. This year we are partnering with four other charities/organisations including; Disability Hate Crime Network, Galop, Inclusion for All and Stop Hate UK. Donations welcome via our Sponsor-me page! 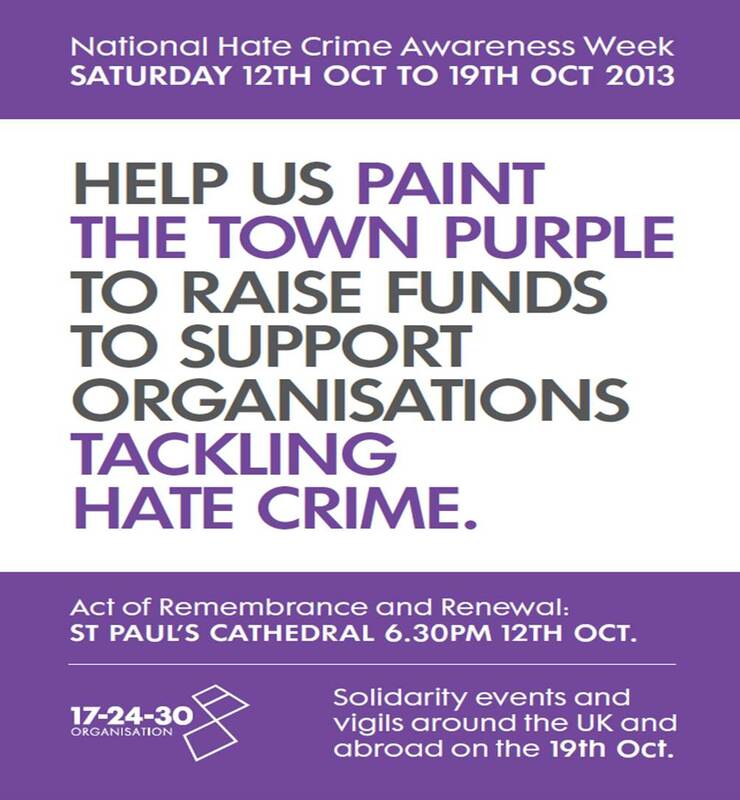 Hashtags – help us promote the week by using the following hashtags #HCAW13, #PaintTheTownPurple,#HateCrimeVigils. Help us by sharing these images on-line. Information Stalls – organise a stall with Hate Crime information, Local Support and Reporting Services. Last year Mencap organised stalls at three major train stations to promote their “Stand by Me” campaign (tackling disability hate crime). Invite your LGBT Liaison Officer – contact your borough LGBT Liaison Officer and invite them to promote their services. Most Police organisations throughout the UK have appointed LGBT Liaison Officers and have specialist Community Safety Units to deal with Hate Crime/Community Safety issues. Metropolitan Police Service LGBT Liaison Officers listed here. Posters – check and update your local Hate Crime posters to ensure you are sign-posting local information. Contact you local council and police for resources to promote their services. Social Networking – help us promote what we are doing by joining our 17-24-30 No To Hate Crime Campaign Facebook page and following us our HateCrimeVigil profile on Twitter. We have set up events to advertise what we are doing but will only be successful if you help us by inviting your friends and sharing our links. You can also sign up for our newsletter (distributed via Mailchimp). You can really help us make a difference wherever you are in the world! And if you miss the week this year you can always start planning for next year! 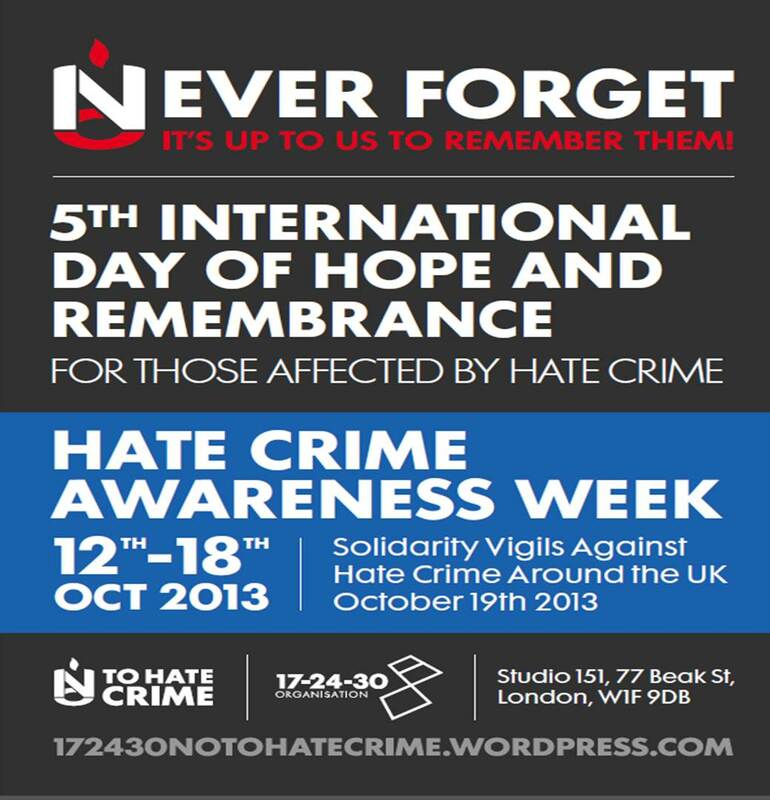 7th Sept 2013 – Public Meeting outlining plans for this year’s Hate Crime Awareness Week.